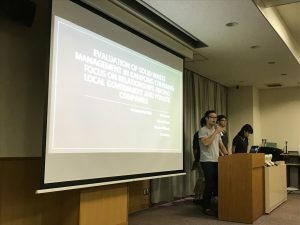 DFW 2018 did presentations on their findings at Ichinomiya city hall on December 5, 2018. 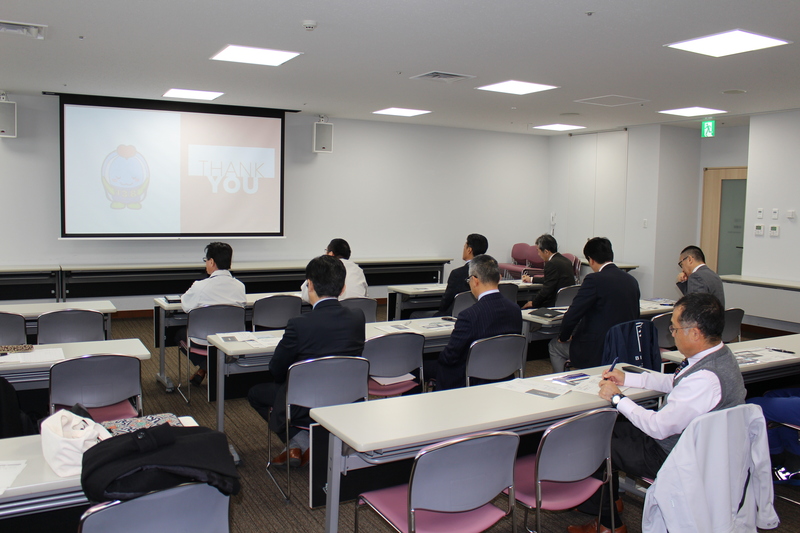 Thank you very much for participating the session! 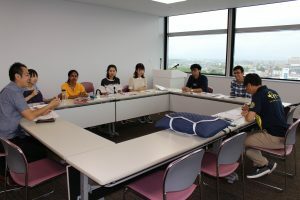 We will work hard on our final report!! DFW 2018 was conducted in Ichinomiya city, Aichi prefecture, Japan from October 22 to 24, 2018. Ichinomiya city kindly arranged the three days program. We greatly appreciate their kind cooperation. We could not have had this fruitful fieldwork without their support. We also would like express our sincere gratitude to the companies which kindly accepted our interview. We divided 10 students into two working groups: Investment Promotion and Textile Industry. 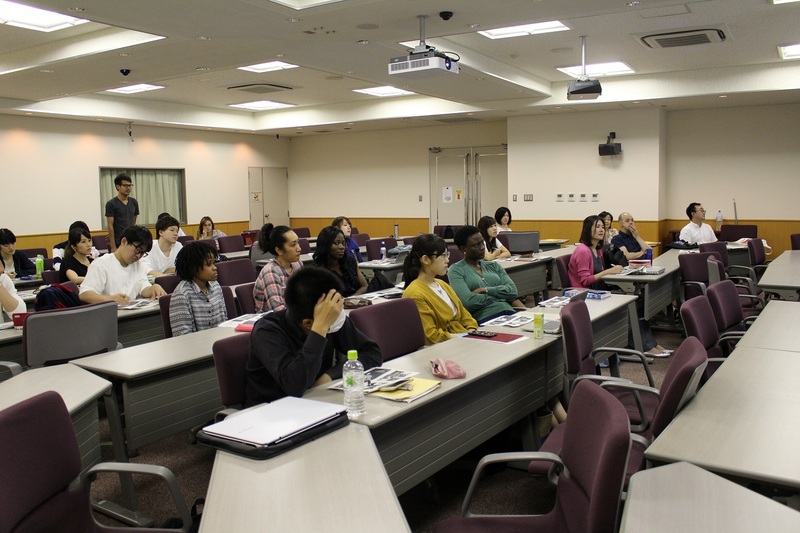 The participants are currently preparing for presentations on December 5, 2018 in Ichinomiya city. We look forward to sharing our findings with people in Ichinomiya city! OFW 2018 was conducted in Kampong Chhnang Province, Cambodia, from September 16 to 30, 2018. The Royal University of Phnom Penh (RUPP) kindly accepted to host the OFW. We would like to express our sincere gratitude to RUPP team, specially Prof. CHIN Sam Ath. 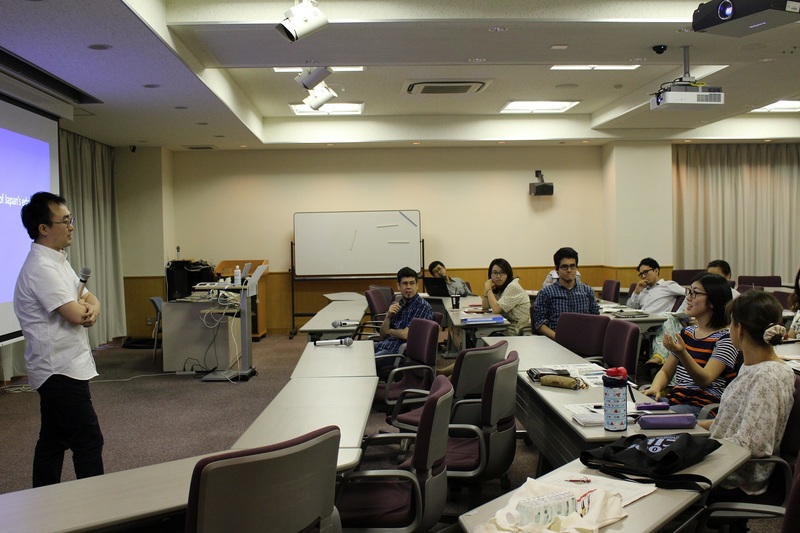 We divided 13 students into three working groups: Economics, Governance, and Education. 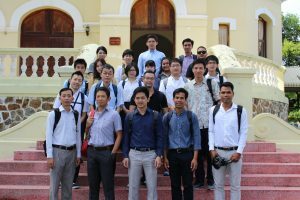 It was a great opportunity for the participants to learn how to conduct fieldwork and experience wonderful Cambodian culture! OFW 2018 participants did presentations on their research proposals. Everybody did a great job! 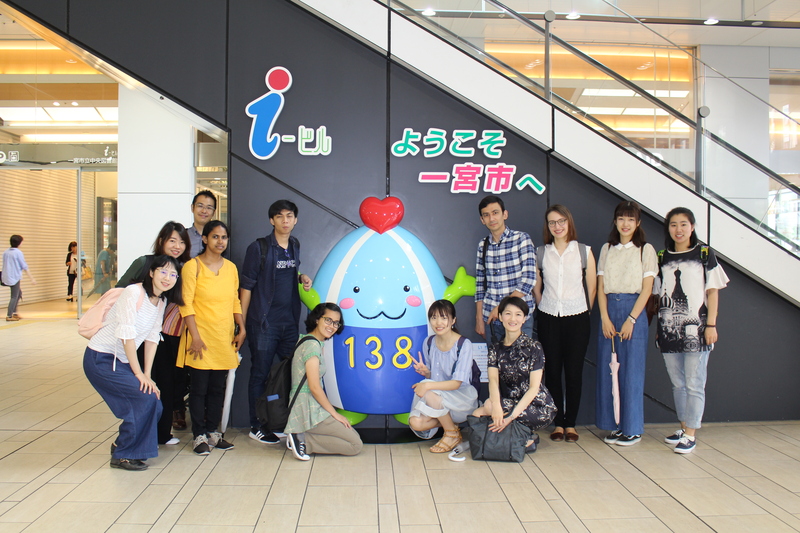 DFW 2018 participants visited Ichinomiya city for pre-survey. We got a lot of useful information! We look forward to visiting there again in October. 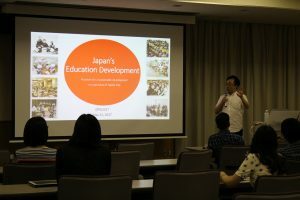 Balanced development is considered the key to education development of Japan. 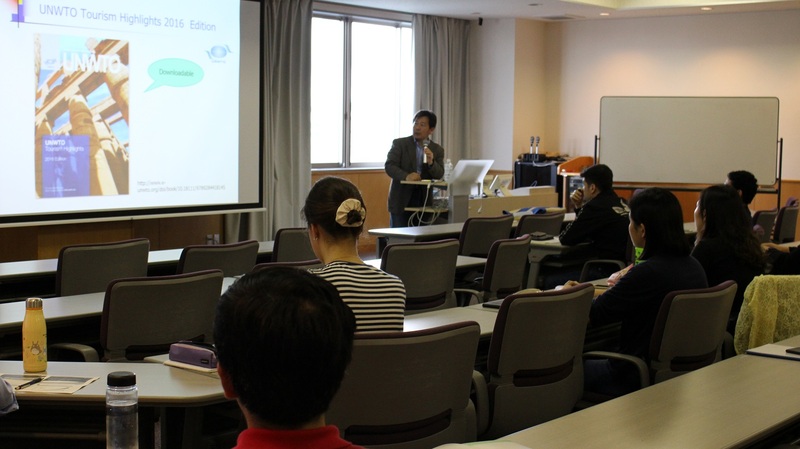 Dr. Jing Liu, shared his understanding and experience in Japan’s education system. 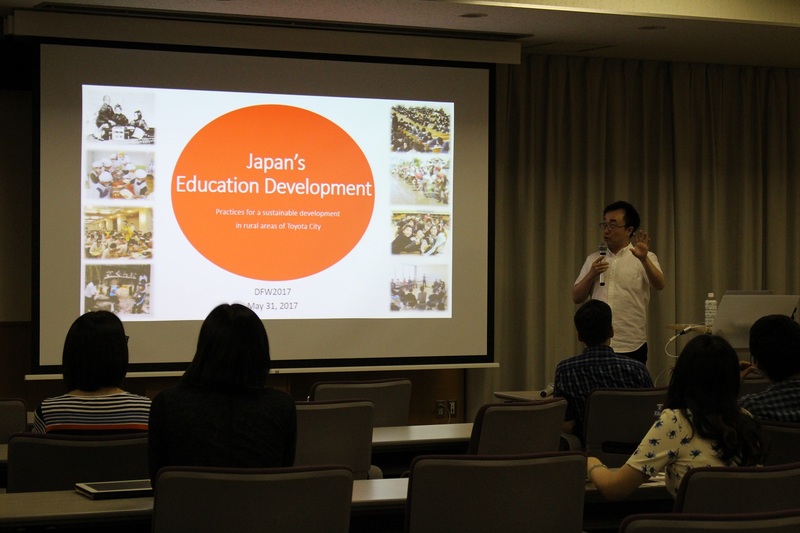 In the first half of the lecture, he reviewed the trajectory of education development of Japan. 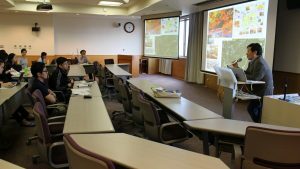 Then, in the secondy half of the lecture, he raided the discussion of what kind of education does rural area of Japan need? 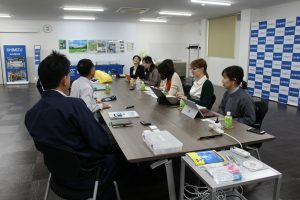 and how to take education as a means for s sustainable development of rural area of Japan. 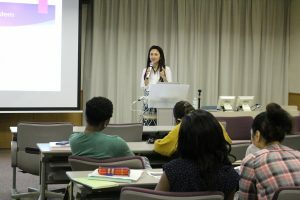 It was the 2nd lecture which Dr. Sopheak Keng gave us during her stay at GSID. 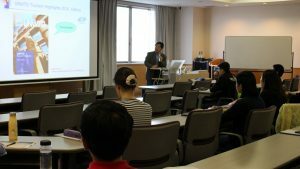 Today, Dr. Keng talked about education development and issues in Cambodia. She gave detailed review of the achievemnet of EFA and MDGs in this country’s education sector. 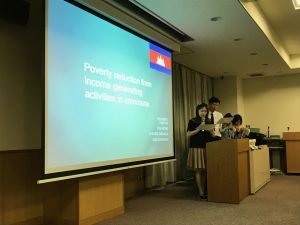 Also, she addressed the issues, such as drop-out and teacher quality, in education setor of Cambodia. She also shared her own experince of manager of private school. 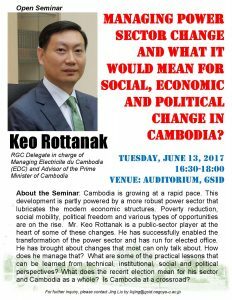 Open Seminar: Managing Power Sector Change and What It Would Mean for Social, Economic and Political Change in Cambodia? 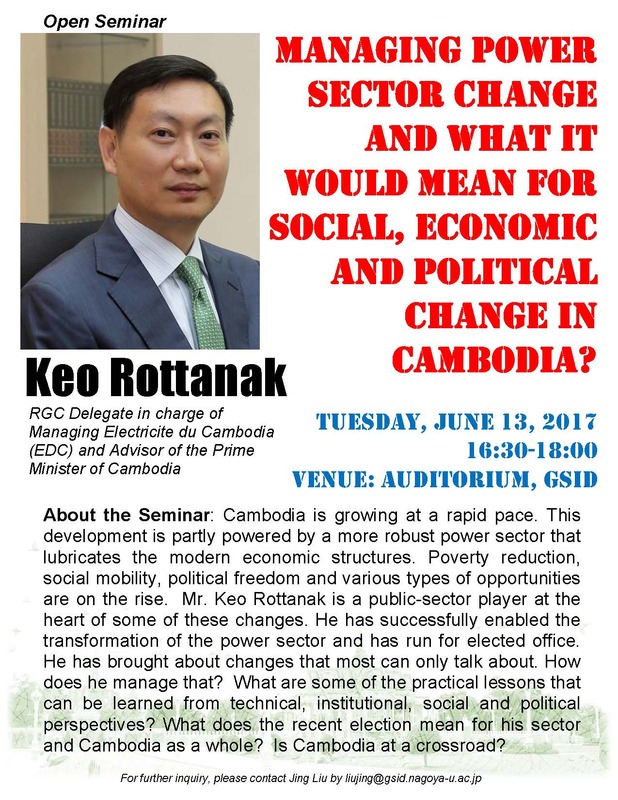 I am pleased to announce an open lecture about Cambodia by Mr. Keo Rottanak. Please find the details below. Mr. Rottanak originally comes from Pursat Province. And he has been closedly involved in the development of this province in the past years. OFW teams are highly recommended to join the seminar. 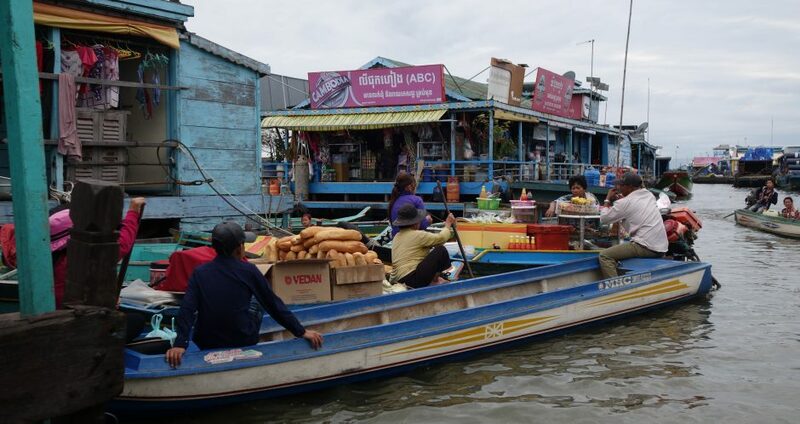 Cambodia’s is growing at a rapid pace. This development is partly powered by a more robust power sector that lubricates the modern economic structures. Poverty reduction, social mobility, political freedom and various types of opportunities are on the rise. Mr. Keo Rottanak is a public-sector player at the heart of some of these changes. He has successfully enabled the transformation of the power sector and has run for elected office. He has brought about change that most can only talk about. How does he manage that? What are some of the practical lessons that can be learned from technical, institutional, social and political perspectives? What does the recent election mean for his sector and Cambodia as a whole? Is Cambodia at a crossroad? Born into a teacher’s family in Pursat province of Cambodia, Mr. Keo Rottanak is currently the Managing Director of the country’s biggest electric company known as the Electricite du Cambodge or EDC. He plays a vital role in helping transform a power sector that used to suffer from a chronic short supply and high cost into a currently robust sector that is powering the fast social, economic and political transformation of Cambodia. A normal rolling blackout across the nation upto late 2009 is no longer the case. Electricity cost now ranges from US$0.11 to US$0.19 per kilowatt hours compared to more than US$1 in early 2000. EDC that was making financial losses to the one that is making huge contribution to the power sector growth in particularly in the fast expansion of rural electrification in Cambodia. 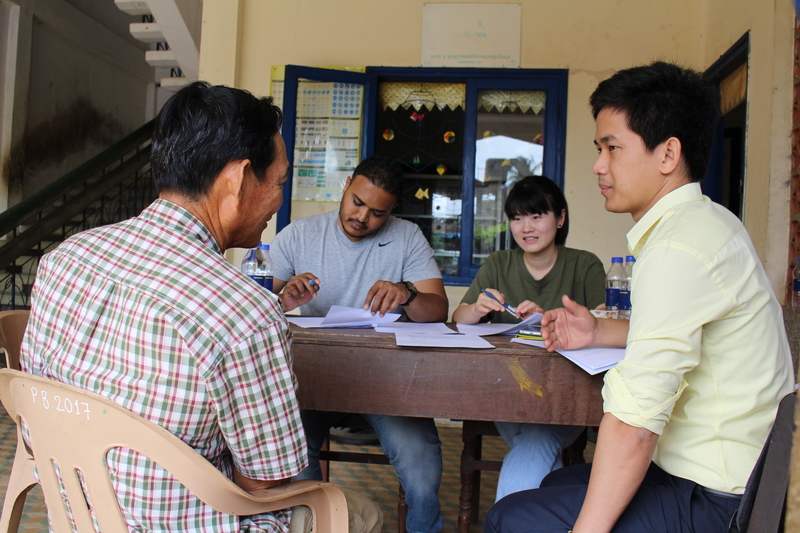 With new financial success, EDC is creating a special fund that helps provide thousands of scholarships to many young Cambodians especially women who would otherwise not be able to attend colleges in the Capital. Always wishing to be a champion for the poor, Mr. Rottanak works in Kroko district in Pursat where his steadfast commitment to local people’s rights to land & natural resources use, equal educational opportunities for the poor, and responsive local governance earned him a landslide electoral win in the 2013 general election thus giving him a parliamentary seat for Pursat province constituency. Already a household name, he continues to serve this community he dearly loves. He expects to do well again in this upcoming June 4th 2017 local election. His success to date is partly due to a perfect Cambodian-USA-Japanese blend of professional trainings at Columbia University as a Fulbright Scholar, the International University of Japan as a Monbusho scholar, and the Royal University of Phnom Penh. His non-degree courses span from Harvard University, the University of Canberra, and Lee Kwan Yew of School of Public Policy. His hobbies range from books, social work to music and movies. Prof. Tetsuo Umemura, who is a specialist in tourism economics, gave us a lecture about the theories, trend and development of this field for DFW participants. He also introduced the concept of sustainable touriusm development for sustainable develompent and current trend of Japan’s tourism development. DFW2017 Seminar: Why do young people have started to rural area in Japan? SATOYAMA is very unique view which can be observed in rural area of Japan. 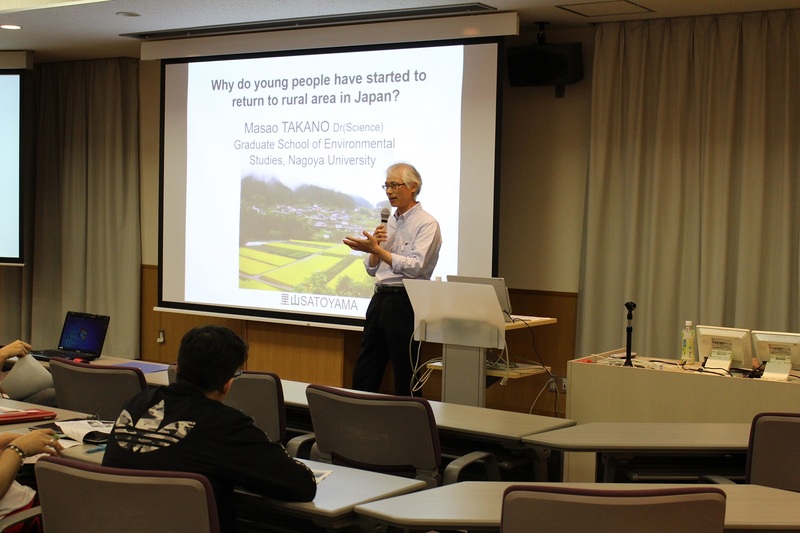 In today’s lecture, Prof. Masao Takano from Graduate School of Environmental Studies, Nagoya University gave us a detailed explanation of SATOYAMA system and the key concepts of this system. Moreover, he talked about the relationship between the SATOYAMA system and economic development and population change. 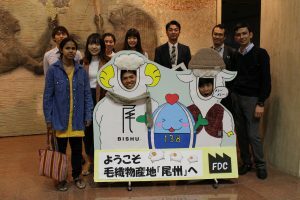 Then, he introduced lifestyle of young migrants in rural area of Japan and why they got interested in life of rural community.